I love cake. Okay, I love all baked goods, but cake is the best. It was my favorite part of all my parents’ weddings. It’s STILL my favorite part of every wedding. I do enjoy the dancing now that I bring my own partner, but while I’m dancing with Andy, I’m totally eyeing that four-tiered, fabulous, elaborate, fondant-covered wedding cake in the corner. I was certainly cake scoping when we went to the wedding of Andy’s Chronically Late Cousin and her man Bubba. The wedding cake was several tiers high. I could see it on the corner of the dance floor. I used it to spot on multiple turns. I saw it again as we chasséd by. Oh, beautiful cake, I thought. What hides under your creamy exterior? Lemon? Chocolate? Mocha with french cream filling? Perhaps each tier is different. As Andy led me away, I gave the cake a smoldering last glance over my shoulder. Soon, my hungry eyes promised. Soon you will be mine. “Do you think the tiers are different flavors?” I asked, as Andy dipped me. “I hope it was Bubba.” Bubba is from Oklahoma. At family dinners, Bubba and I commiserated over the lame oranges that the Chinese try and pass off as dessert. The music changed to a slow song, and I caught another glimpse of the wedding cake as Andy pulled me close. Be chocolate, Mr. Wedding Cake. Please be chocolate. After an eternity, Bubba and Andy’s Chronically Late Cousin cut the cake. It was boring yellow, but still good. I devoured my piece and pulled Andy back on the dance floor. Halfway through the song, I noticed that other guests had chocolate cake. “Look!” I hissed at Andy, nodding my head at the lucky guests. Why can men get second helpings without fear of censure? Why does chocolate taste so much better than vanilla? I decided that the answer to #1 was “A double-standard based in an outdated patriarchal system where a woman’s worth is equal to her attractiveness.” The answer #2 didn’t really matter. It was just a sweet fact of life. 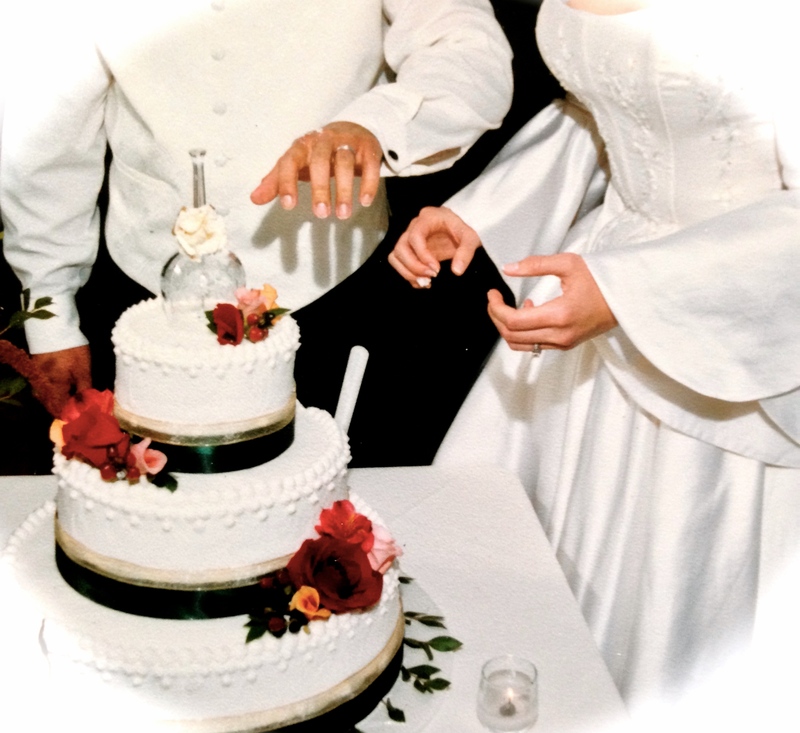 Are brides “loony” to pay thousands of dollars for showcase cakes? Andy thinks so! Andy’s question wasn’t as crazy as it sounds. I made a tiered Chocolate Oblivion Torte for Chronically Late Cousin’s wedding shower. I did a tiered cheesecake for a friend’s baby shower, a heart-shaped engagement cake, and every year on Andy’s birthday, I make him a three-layer Devil’s Food cake covered in poured ganache frosting. Like I said, I love cake. But there was no way I would even attempt my own wedding cake, in the wilds of New Hampshire without all my equipment, and the week of my wedding. I needed a pro, and there was only one game in town. Until Boyfriend-Stealing Baby Sister found another game. The Christmas before the wedding, Baby Sister produced Andy’s best present of all. 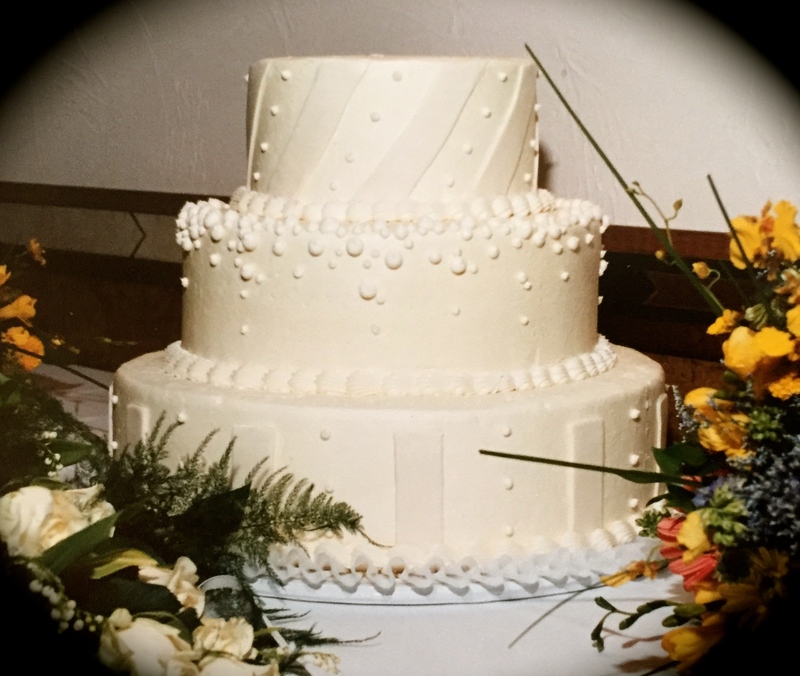 She found, through word of mouth, a little old lady who supplemented her retirement income by making wedding cakes. We went to see the New Hampshire Cake Lady. NH Cake Lady had no samples ready, no big shiny showroom, just a little scrapbook with some pictures in her own kitchen. Although there were no big showcase cakes, there were very attractive tiered cakes, decorated with ribbons and flowers. Sometimes, you get to have your cake and eat it, too. I love cake. Good moist cake. Chocolate or vanilla or lemon. Anything but carrot and no damn cream cheese icing. Sorry….I’m drooling on my keyboard. Love those little old ladies. Wow. Just wow. I love cake too. All cake. (Unless it’s poorly made/ untalented cook) Quite the coup scoring the older lady supplementing her income .. Guess boyfriend-stealing sister might have redeemed herself? Dang, wish I could have been at your wedding!!! 3. Where did you find such a dream man that secretly helps you get a second slice of cake? AHAHAHAHAHAH. Autumn I love you. I think I am the minority. I can’t handle cake in the States – way too sweet for my liking! Not only that, I am allergic to chocolate. The only time I could have cheesecake or cake like in the above was in Taiwan – they make it less sweet. Much less sweet. I hear you — most buttercreams aren’t real buttercream in the U.S. anyway — it’s lard or vegetable shortening with powdered sugar. Way too sweet. 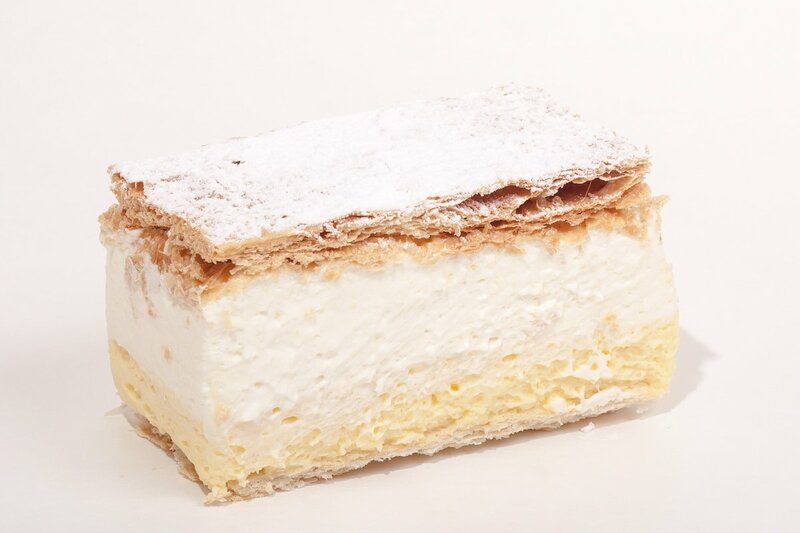 If made properly, with egg whites or egg yolks and butter, frostings are richer, but less sickeningly sweet. I generally don’t eat the frosting on kid’s birthday cakes! Wow! Constance, that is an AMAZING bargain. I’m not telling Andy. Cake. Cake. Cake. Amazing thing ever created and even the word cake is amazing. It sounds amazing. Enough said. And I agree – chocolate cake is the best, way better than vanilla (though I’m not too sure about chocolate ice-cream. Sometimes I find this ice-cream overwhelming). I like my cakes fluffy, not too compact in texture. Not grainy. If I had to pick a favourite cake flavour, it would have to be Black Forest. A lot of cakes these days come with cream. I’ve had cake where the cream looks nice as decoration, but when it hits my mouth it either tastes overly sugary sweet or thick as yoghurt. My mum is a big fan of chocolate cake. So is my dad. And the rest of my relatives too, actually. Whenever someone’s birthday rolls around and there’s a celebration, the person in charge of the cake will rustle up a chocolate cake. Actually, for the past five years, my brother has been to the same shop and ordered the same chocolate (mousse) cake for his birthday, much to the delight of my mum (it’s a bit too rich for my liking. Oh, I love chocolate mousse. I prefer desserts which are richer (i.e., with heavy cream or butter) than those that have more sugar. Most frosting in the US are now sugar and lard and they taste nasty. Give me a cake with a whipped cream, ganache, or French cream frosting any day. Or a true Italian meringue, egg whites whipped with butter and sugar syrup. I’m kind of surprised by the sweet tooth in your family, though — many of Andy’s relatives find western desserts way too sweet. So on your side there. Frosting is not my cup of tea, except on the occasional cupcake. In contrast, my parents don’t like cream or butter with their desserts, even cake. My mum always pushes the cream aside when she eats cake – and it’s not because it’s fattening or unhealthy. I always thought Asian desserts are sweeter than Western desserts, but it would depend on the individual’s palate …it’s something I’ve thought about writing for a while. Autum, I have to tell you something but promise me you will not freak out. Ok, here it is: in weddings in China, guests don’t get to eat the cake. There is a cake with several layers, and the couple makes the “cutting the cake with a sword” scene, but then the cake is never cut into pieces and distributed to everybody. I suspect it is… (omg prepare for this)… a fake cake made of styrofoam and only a real part so they can cut it in front of everybody. Or maybe it is that the couple eats the whole cake themselves. The fact is, I have never eaten cake in a wedding in China! So sad. Marta! NOOOOOOOO, say it ain’t so! NOT EAT THE CAKE?!! Oh, the humanity! Actually, I’m not surprised. In the U.S., they actually have styrofoam cakes, too. They are wheeled out for pictures, then wheeled away and a regular sheet cake is cut in the kitchen and passed out. But at least some cake, no matter how lame, gets eaten by guests. 🙂 I think Americans might riot without their cake. 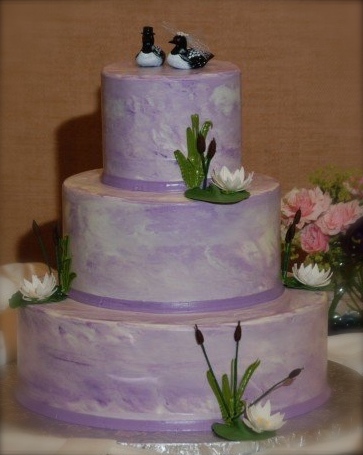 Although people have gotten really creative, with pies, cupcakes, and even doughnuts as wedding cakes. I used to hate cake, but the past several years its grown on me. My favorite is flourless chocolate cake or white chocolate raspberry cheesecake. I recently combine the two–WOW. For our wedding we got an ice cream cake from Cold Stone Creamery (despite it being the middle of winter) since at the time I wasn’t a cake person. It wouldn’t have mattered anyways; I never did get a piece of that cake. So sad. NO! Who ate the bride’s cake? Inexcusable. Should be punished by public flogging. 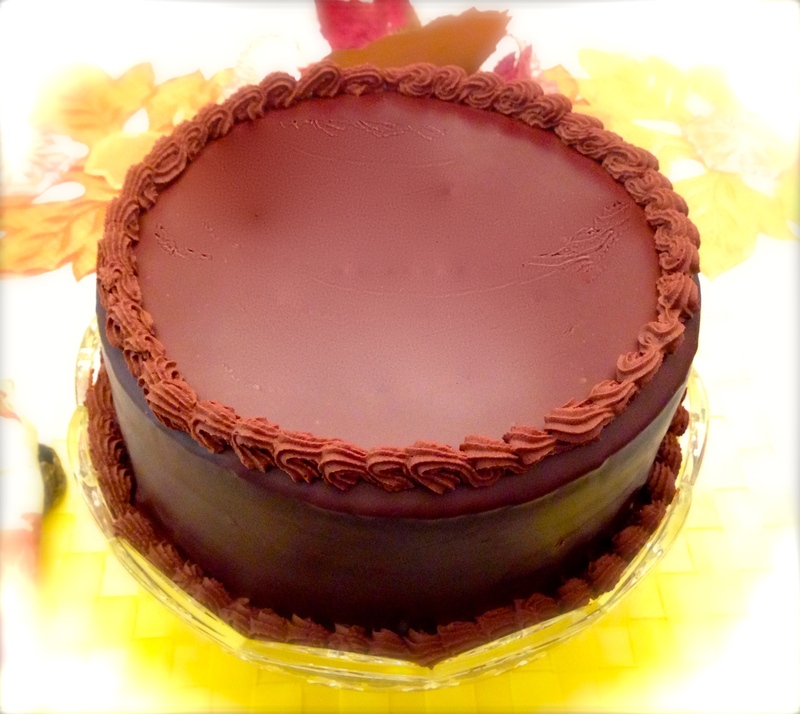 I would make you a Chocolate Oblivion Torte wedding make-up cake if I could! No flour, just expensive chocolate awesomeness. Rose Levi Bernabaum’s “Cake Bible” has the recipe. Catching up on reading this at work since I’ve been slammed with overtime and now all I can wish for is cake…..:( sigh. But girl I’m with you, I don’t care about the wedding dinner, I want to try the cake. I get so annoyed when its fondant too, gross. YES! I make myself hungry, too. What cake would you have? And since it’s time for supper, off I go. I now want kremeschnitte. Whatever this is. Is this like the filling in Napoleons or chocolate eclairs? And I bought no cake! -Cry- There were too many people in the store and I didn't manage to get some. Boohoo. That looks a lot like a Napoleon, only with slightly less layers. The Heidelberg Bakery in Arlington, VA makes a divine one!